There aren't many U.S. retail industry leaders who know more about building a world-class retail brand than Starbucks Founder Howard Schultz. When Howard Schultz talks, business leaders and retail managers around the world listen. Schultz's comments about what it takes to succeed are manna from heaven to CEOs everywhere because they're what led Starbucks to be one of the world's most valuable retail brands. More than just a coffee and pastry shop, Starbucks stores are famous around the world for their uniquely branded customer experience which is more a way of life and one envisioned under the leadership of Shultz. 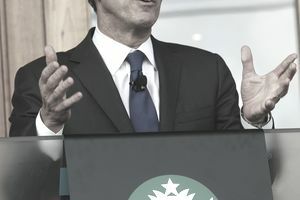 The leadership beliefs and principles that have guided Schultz (and the world-class Starbucks brand) are culled from interviews, speeches, and books over the past four decades. What follows is a collection of the most inspirational and insightful Howard Schultz quotations about building the Starbucks brand. "What Starbucks has created around coffee is an extension of the front porch. If you look at the U.K., the English pub is an extension of people's homes but for a different beverage. Our stores have become a gathering and meeting place in addition to a place to purchase coffee." "While we are a coffee company at heart, Starbucks provides much more than the best cup of coffee. We offer a community gathering place where people come together to connect and discover new things." "Starbucks represents something beyond a cup of coffee." "Providing our customers with innovative and unique ways to discover and acquire all genres of great music is another way we are enhancing the Starbucks Experience." "Just as we have demonstrated with music, we believe that Starbucks can ultimately change the rules of the game for film marketing and distribution." "We establish the value of buying a product at Starbucks by our uncompromising quality and by building a personal relationship with each customer." "Starbucks is rekindling America's love affair with coffee, bringing romance and fresh flavor back to the brew." "We believed very early on that people's interaction with the Starbucks experience was going to determine the success of the brand." "We have no patent on anything we do, and anything we do can be copied by anyone else. But you can't copy the heart and the soul and the conscience of the company." "We look at the brand not as a piece of advertising, but everything we do communicates who Starbucks is. The place, the physical environment, really has become an extension of the brand and it's very important to the success of the company." "Whatever your culture, your values, or your guiding principles, you have to take steps to inculcate them in the organization early in its life so that they can guide every decision, every hire, and every strategic objective you set." "The taste of our coffee has really created such a quality experience that we've been able to convince people over the last 20 years that it's still a very good value even though it's more expensive than the traditional coffee you find at a diner." "Coffee will always be the core of what we do. So many companies have made mistakes by not sticking to their brand, and they start believing their own press. That's not going to be us." "If you want to build a great enterprise, you have to have the courage to dream great dreams. If you dream small dreams, you may succeed in building something small. For many people, that is enough. But if you want to achieve widespread impact and lasting value, be bold."